← Grab the green tea: the Foodies go healthy! Over the last couple of weeks we’ve been so busy pickling and bottling chutneys, relishes, cordials and alcoholic delights that unfortunately the blog has been lower on the list of priorities. We’ve been rescuing over-sized, unloved marrows and cucumbers, dealing with bumper crops of tomatoes and foraging for elderberries, blackberries, sloes and rosehips – before the birds eat them all. The kitchen looks like a bottling factory and we even had to put a call out via twitter and freegle for more jars. Now I’ve got a few minutes peace and quiet I think it’s time to post, but what about? so much has been going on. I could share with you the excitement of making piccalilli for the first time (maybe I should get out more) – but it won’t be ready for at least a month so I can’t tell you how it tastes or if it turned out fabulous! So back to cheese! 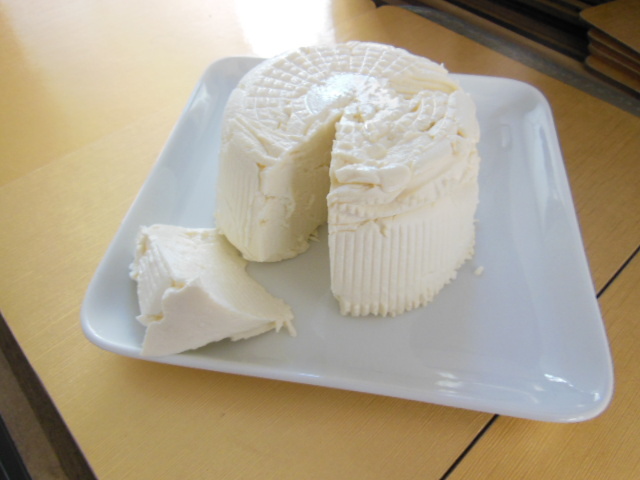 I guess this is a refresh of our first cheese-making post many months ago Bulgarian Sirene cheese. Essentially cheese making is a simple thing. Milk is heated, the curds and whey are persuaded to part company, the curds are strained and drained, then the cheese is pressed into shape, seasoned and left to mature. It’s been done for years by frugal housewives and farmers wives across the world without the need for clever gadgets or complicated techniques. But that doesn’t mean that it’s not magical – somewhere in the process the milk becomes cheese – and to me that’s an amazing thing! Heat 2 litres of full fat milk in a large pan to 38 degrees – hand hot blood temperature. Remove the pan from the heat and add 1 tsp of rennet. Stir well and leave uncovered for 15 minutes. The milk will begin to set and separate into curds and whey. Rescue the curds into a muslin-lined colander placed over a large bowl. Leave to slowly drain for about an hour. Next tie-up the four corners of the muslin into a loose parcel and hang-up to continue draining. We find hanging it from the handle of a kitchen cupboard over the bowl works well – until you want a cup of tea and it’s the mugs cupboard that is! Leave it for a few hours, then tip the contents into a cheese mold if you have one (Lakeland sell them cheaply). This will shape up your cheese into a presentable and identifiable item that you can feel proud of. 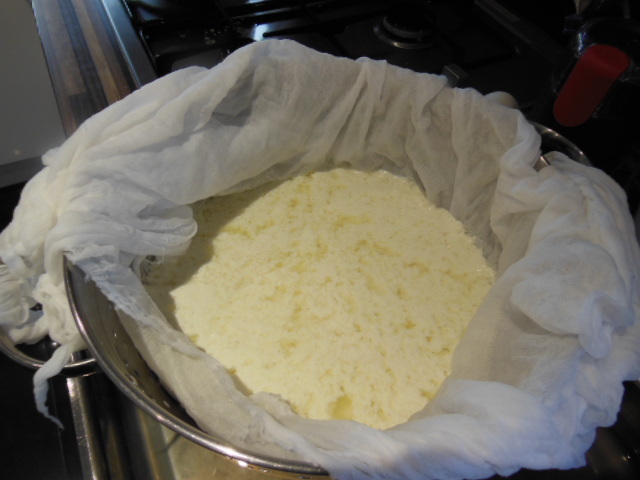 The result will be a soft, fresh cheese similar to ricotta or mozzarella which can be salted and eaten with crackers or sweetened and turned into cheesecake. Either way it is a thing of beauty, the cheese-making magic has happened and with a bit of time, patience and TLC you have transformed a £1 bottle of milk into real homemade cheese! If you’re being really frugal at this point the leftover whey can be reheated to produce a ricotta by adding lemon juice. Alternatively the whey can be used as a stock for soups or cooking rice, adding a rich, creamy, slightly cheesy flavour. It’s high in protein but low fat. Finally any leftover whey can even be used as tomato plant feed. Not bad for £1. 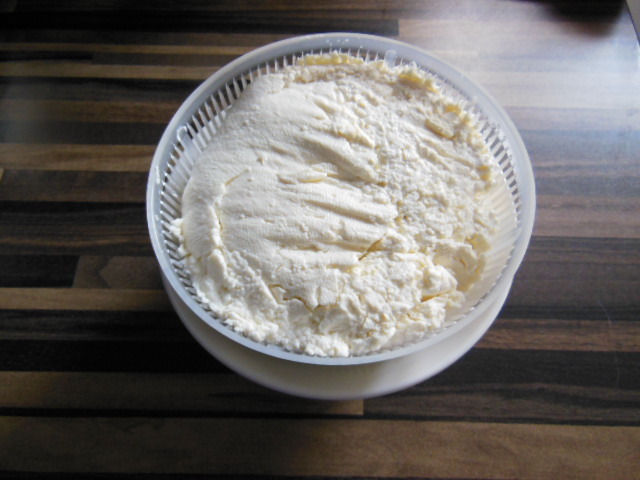 This entry was posted in Recipes and tagged cheese, Cheesemaker, Curd, Milk, Whey. Bookmark the permalink. Your cheese looks lovely! Have you thought of making others? It is a lot easier than most people believe. There’s a free 20pg beginner’s guide on http://www.homemadecheese.org so everyone can have a go. Thanks for the link – will have a look. 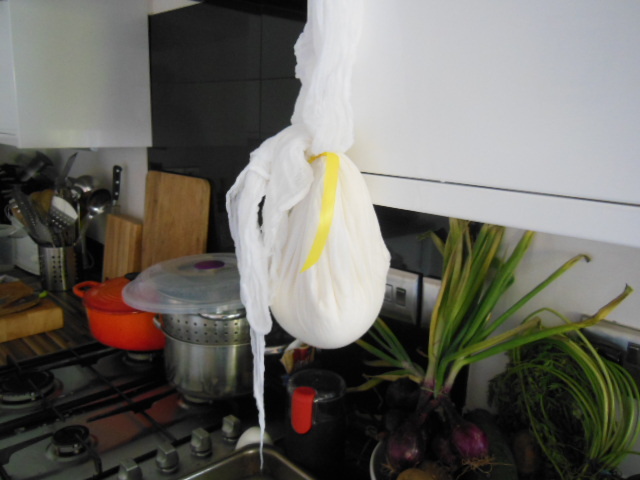 I am so going to try this, I love fresh cheese! Where did you get rennet from? You can buy it from Lakeland or Planet Organic. Enjoy!